There are just not enough hours in the day. 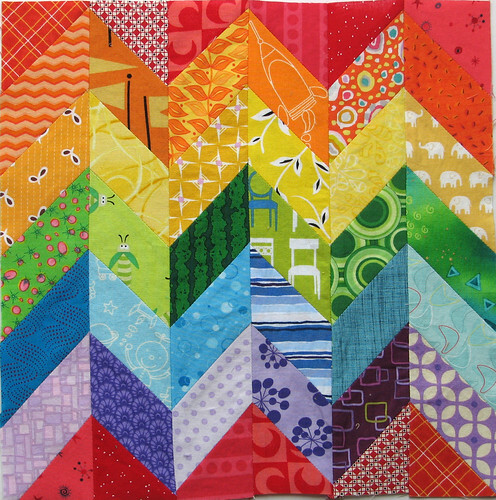 I have had to take a break from these rainbow blocks because Easter is coming up and I need to make Easter gifts – not to mention the various birthdays that have been popping up. And then June is my daughter’s birthday and I have so many things I want to make for that! I don’t know how so many other quilters produce such a large amount of quilts in the same time it takes me to make one. They must not sleep. Or have children. Or, at least, have my children. I have made zig zag quilts before, but I used shortcuts to make them. That means that the various zig zags were broken up into triangles. That’s a fine look when your fabrics are mostly sold and the same for each “line” of zig zags. But, I could not conceive of a short cut for this block, since I wanted each piece of fabric to remain whole. That meant that I had to make a template of a parallelogram, cut one out of each fabric, and sew them together without skewing the seams. The sewing them together was the hardest part. The perfectionist in me wanted to outline the quarter-inch seams on the back so I could perfectly match up corners with pins. But the practical side of me nixed that idea and just winged it. It came out pretty well. My only qualm is that the value of each color is not uniform, but I didn’t have enough variety of fabrics to make that happen. So, the light purple is mixing with the dark and the lime green is mixing with forest green. We can all get along, right?